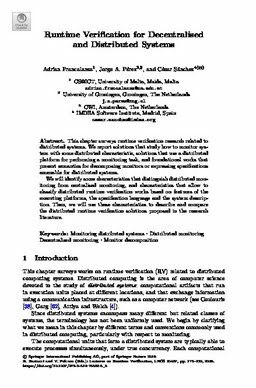 This chapter surveys runtime verification research related to distributed systems. We report solutions that study how to monitor system with some distributed characteristic, solutions that use a distributed platform for performing a monitoring task, and foundational works that present semantics for decomposing monitors or expressing specifications amenable for distributed systems. We will identify some characteristics that distinguish distributed monitoring from centralised monitoring, and characteristics that allow to classify distributed runtime verification works based on features of the executing platforms, the specification language and the system description. Then, we will use these characteristics to describe and compare the distributed runtime verification solutions proposed in the research literature.